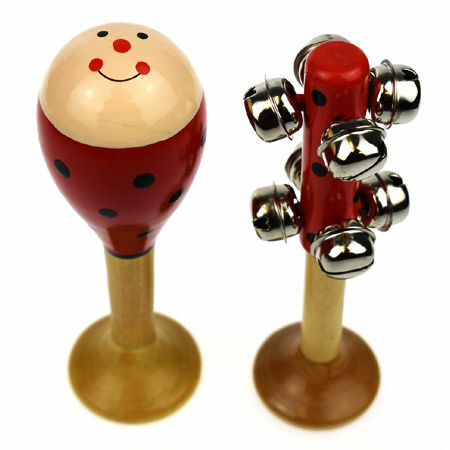 Mini Maraca Bell Stick Ladybug are two lovely little percussion instruments. These small musical toys have varnished handles and painted bodies and are decorated with ladybugs and red and black strips. These musical toys have bases so they can stand up. The base also prevents a small child placing the handle in their mouth. Both the Maraca and bell stick have a lovely gentle sound and they are presented in a cardboard box to keep them safe. A lovely gentle sounding light musical toy which is suitable for 18 months plus. We like this because: "Sweet simple and nice and light."